A LIGHT TURN-OUT: Rain may have kept some Princeton voters away Tuesday morning. 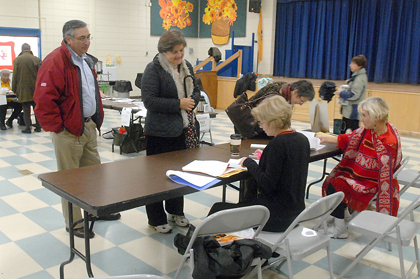 Shown at District 7 in Community Park School are (standing, from left) Anthony and Maureen Marchetta, and (signing in) Louise Coolidge, a distant relative of U.S. president Calvin; at the table (from left) are Emily Reeves and Meryl James. Democrats swept the Princeton Borough and Princeton Township municipal elections Tuesday night in the Princetons’ first fully contested vote since 2005. With unofficial tallies reporting in all 14 districts in Princeton Township, the incumbent Democratic slate of Committeeman Arden “Lance” Liverman and Mayor Phyllis Marchand took just over 64 percent of 6,758 votes cast, handily defeating Republican challengers Esther Mills and Cindy Randazzo. A proposal to change the age standard for housing on a 20-acre Bunn Drive property in Princeton Township could result in the municipality implementing a major change in senior housing policy. While the latest contributors to downtown Princeton’s retail scene may inject a renewed vitality into Princeton’s streetscape, they also, in some cases, revive a familiar presence. Although Bridge Academy art teacher Sarah Bernotas was intrigued by TerraCycle’s graffiti arts initiative, it was the Trenton-based company’s recycling program that really caught on at the school. What had been something of a poster child of Princeton Borough’s stalled downtown redevelopment project, is now, finally, looming over Hinds Plaza, providing good news for a project that, recently, has been lacking just that. Change at the Princeton Shopping Center does not always bode well for its customers. As Sydney Johnson takes the helm of the Princeton University mens basketball team, the 33-year-old rookie head coach will need to utilize his trademark energy and enthusiasm. Courtney Banghart has captured the full attention of her players on the Princeton University womens basketball team. Carys Johnson stumbled out of the gate this September as she started her senior season with the Stuart Country Day field hockey team. He was the first in his family to go to college, graduating Phi Beta Kappa from Rutgers; he worked on the General Motors assembly line in Edison; he built a radio, took apart a TV, and repaired a radar set in the army. He stage-managed, directed, and appeared in numerous amateur drama productions; he taught seventh and eighth grade math; he was Communications Director of the New Jersey Education Association, and operated his own public relations firm; for 19 years he served on Princeton Borough Council, more than 13 of which as mayor.